If you’ve ever spent any time in a car with me (unlikely), you’ll know how much I loathe driving around. I love traveling around to see new places, but the instant the words “road trip” are uttered, I’m probably already figuring out a way to get out of my travel plans and stay at home on the couch instead. I’ll go to great lengths to avoid being in the car for anything longer than about half an hour. Being stuck in a tiny metal box feeling increasingly nauseous is definitely not my idea of a good time, no matter how pretty the scenery is (I get really, really carsick). Well, almost no matter how pretty the scenery is. There’s one trip that has nearly made me reconsider my opinion, and that’s driving down from Edinburgh, Scotland to England’s Yorkshire region, a trip I took with my parents earlier this summer. Catching up with old friends is always nice, but it’s even more fun when you get to go visit them in an exciting city. One of my best friends from home actually ended up doing something like me as an adult – she grabbed her dual passports and hopped on the next plane to Europe. Only I should really say I did something similar to her, as she did it first, heading off to a small city in Scotland for college. Just a little while ago she moved to Edinburgh, and it was so much fun to discover the sights of her new city with her. She may be relatively new to Edinburgh, but she already knows about some really incredible places in the city, from a fantastic shop that sold old maps to little cafés where J.K. Rowling wrote Harry Potter (confession: I am a huge Harry Potter nerd so I freaked out). We also had a lovely day out at the the city’s botanical gardens, where we enjoyed a very tasty lunch. 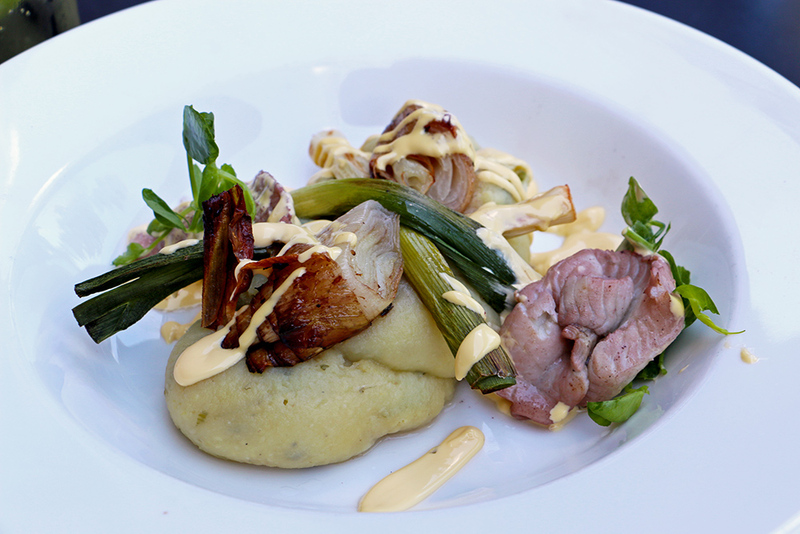 British food gets a bad rap, but Edinburgh has some fantastic food if you know where to look. Luckily, having a charming local guide helps you find the best eats! Right, we didn’t go very far for this stop. 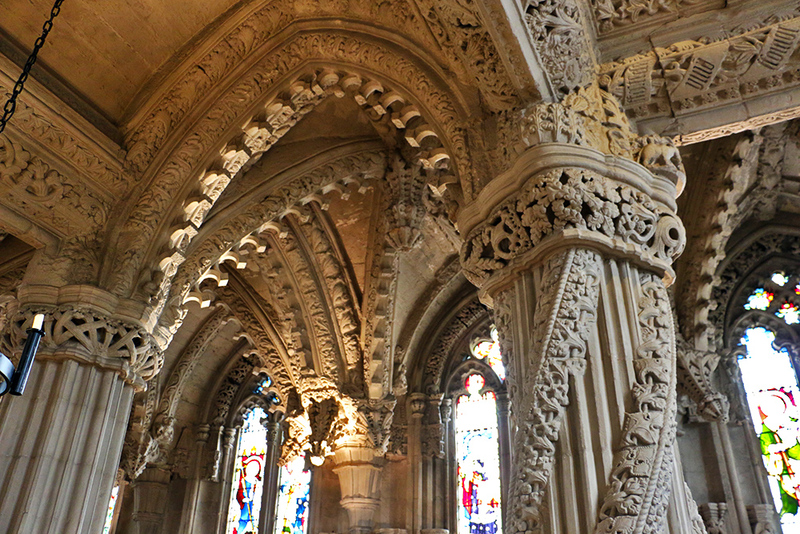 Rosslyn Chapel is only a few miles outside of Edinburgh, but it would have been a shame to drive past such a spectacular sight. This small church’s sandy copper walls overlook lots and lots of rolling green countryside. 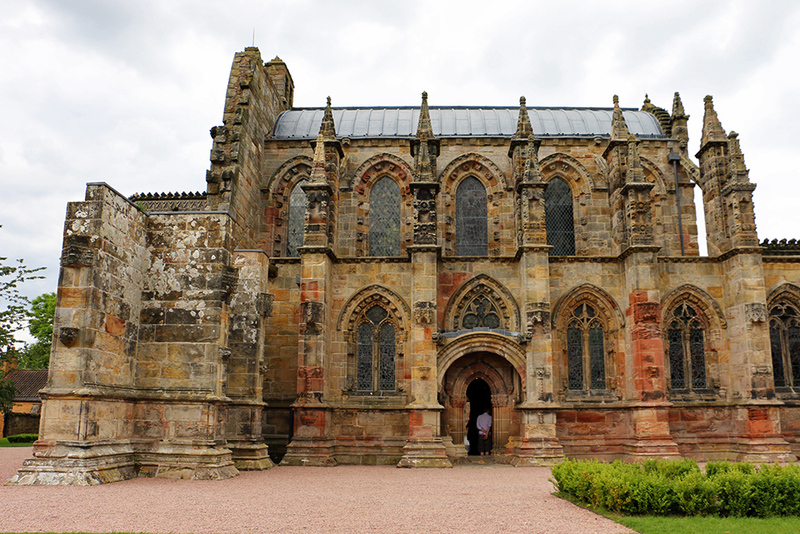 You may have spotted Rosslyn Chapel in the Da Vinci Code movie. There are apparently quite a few people who believe it’s involved in mysterious groups like the Freemasons and Knights Templar, partly because of some of the unusual carvings on the inside of the chapel, like one of two riders on one horse. There’s also a very cool carving of the seven deadly sins and seven virtues on one of the arches, but ‘greed’ is with all the virtues and ‘charity’ is with all the sins. Hmm…what fancy conspiracy theory can you come up with for that one? Oh, and this is one of those annoying places that doesn’t let you take photos inside (apparently somebody tripped and fell a few years ago on the chapel’s uneven floor while taking a picture), but I sneaked a few anyway. The ceiling was just so intricate I really could have spent all day there snapping away. Look at me, taking down the system, one illicitly obtained photo at a time. One of the definite advantages of taking a road trip over a flight is that you can say “Oooh, what is that? Let’s stop and get out and have a look!” While I don’t enjoy being in a car, this is something I love about road trips, and on this trip there were lots of interesting little things to have a look at, like a couple ruined abbeys. 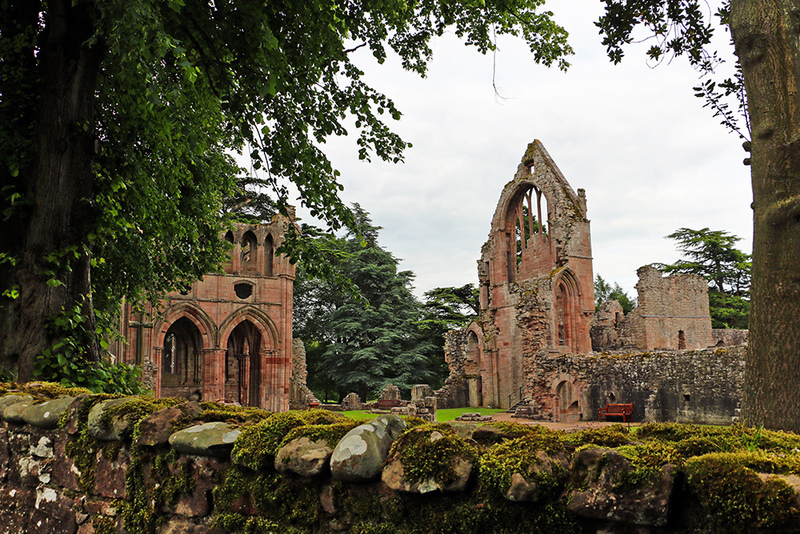 The first one we came across was Dryburgh Abbey in the Scottish Borders, just a few miles off the main road we were taking. Unfortunately, we managed to get there just as the abbey was closing for the day. But a very kind security guard let us in on a secret – there’s a little public footpath that goes past the side, so you can peek over and get a good eyeful of the abbey. 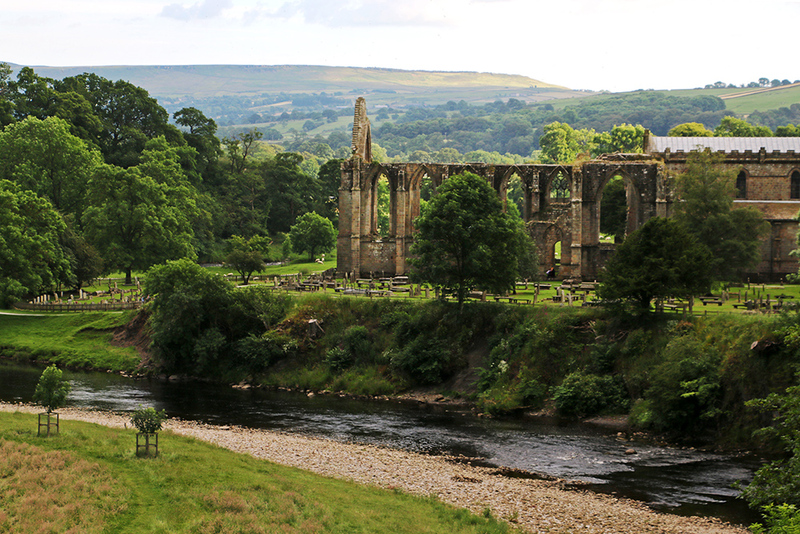 Later on down the road in Yorkshire, we were rounding a corner and suddenly this incredible view popped up. I’d already begged for the car to stop a few times to take pictures of the scenery and we really wanted to get to where we were going…but there was no way we could just drive past Bolton Priory. 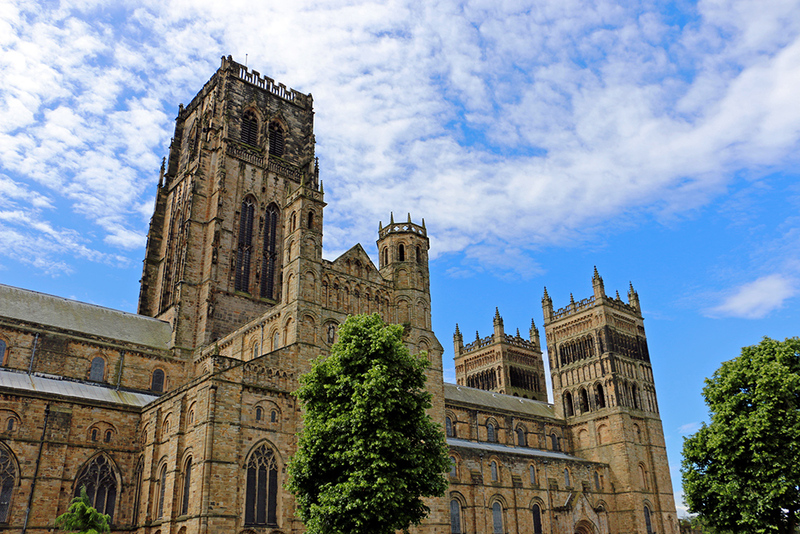 The first overnight stop we made was in Durham, which I’d never been to, but it had the triple allure of being on the way, being featured in the Harry Potter movies, and having a UNESCO World Heritage Site (for the castle and the cathedral). It turned out to be a great little day stop! First up, we visited the cathedral half of the UNESCO site. 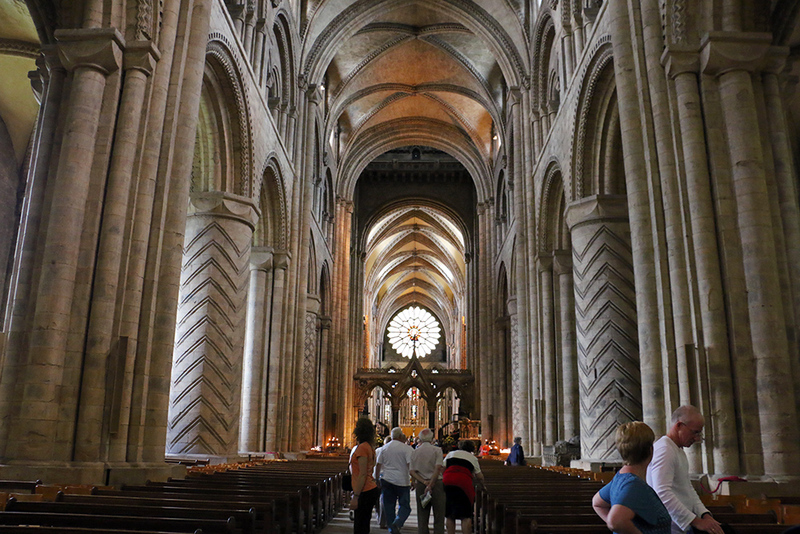 Now, living in and traveling around Spain means you end up visiting lots of churches and cathedrals, so I’ve seen a fair few in the past couple of years, but the Durham Cathedral was still something really special. The outside seemed to glow golden on the pretty sunny day we visited, and on the inside each column had different patterns carved into the stone. Every inch was really beautiful. The cathedral is also where some scenes from the Harry Potter movies were filmed. Check out the courtyard cloister, and you may recognize it from the first two movies. Oh, and this is another place where you can’t take pictures inside (but I had a few anyway, annoying tourist that I am). The castle is the second UNESCO site, and it’s also rather quite spectacular. Today it’s not a castle at all, but instead student dorms at Durham University! Yup, students here actually get to live inside a castle, living up to the fantasies of Anglophiles everywhere. Their dining hall is said to be the oldest working kitchen in the U.K., and it serves the students formal dinners twice a week. Things are pretty fancy here. Did you watch the Tour de France this year? If you did, you probably saw the cyclists biking up and down some very beautiful and very steep hills. 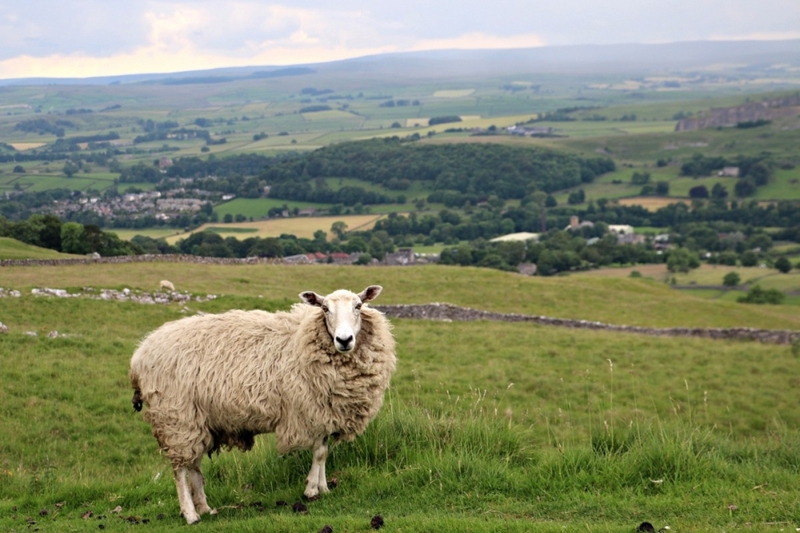 Those are the Yorkshire Dales, and they were very excited to host the opening stages of the Tour this year. We drove through pretty places with funny names like Appletreewick; you may have seen Buttertubs Pass on Le Tour. Yorkshire is sometimes called “God’s Own Country”, and even if you’re not outdoorsy it’s hard not to appreciate how truly beautiful it is. If you are outdoorsy, however, there’s lots of great hiking, biking, and walking to do around here. Just watch out for any stray sheep! I am not especially outdoorsy, but even I could appreciate the splendor of the countryside whilst sat happily in a café tucking in to a cream tea. But seriously, this is some of the most beautiful countryside I’ve seen on my travels. Maybe that’s why the Lonely Planet picked Yorkshire as one of its top places to visit in the world this year! We finished off our tour of the U.K. with a little day trip to York, which may be my favorite smaller city in the U.K. (so far). It seems like every single inch of the city is covered in some kind of cute little detail. 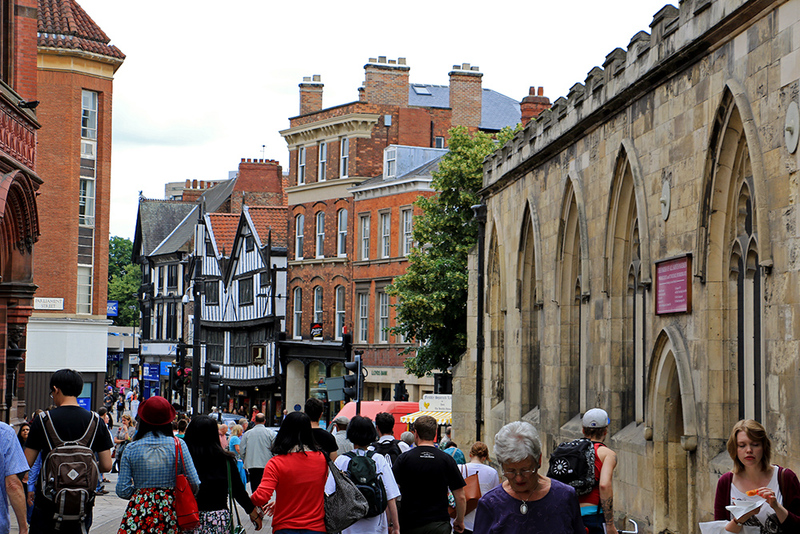 Of course, I’m not alone in thinking that York is quite lovely; it’s a very popular place for a day trip and is filled with visitors oohing and aahing over the charming sights. 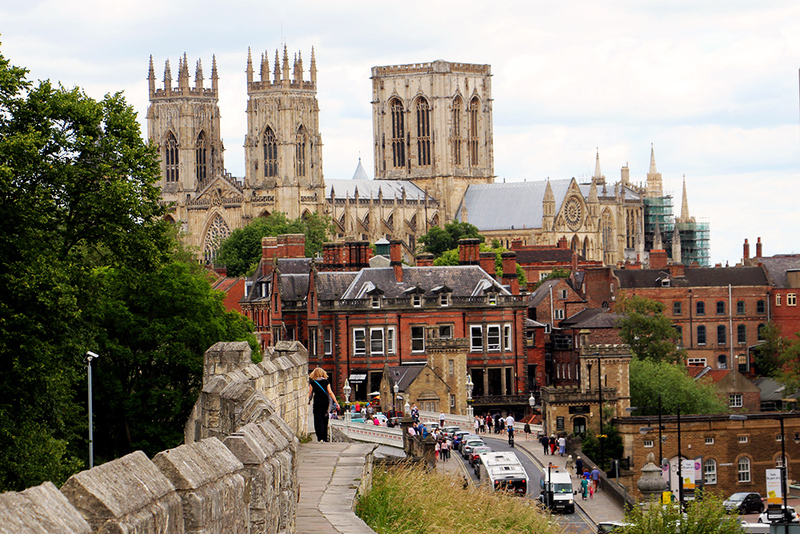 The main attraction is York Minster, the biggest cathedral of its type in Northern Europe. The inside is light and airy because of the gigantic stained glass windows that let the light pour in. If you’re feeling energetic, you can walk up the 275 steps to climb the towers for some really amazing views. I was not feeling very energetic, but I do have the certificate to prove that I have done it at some point in my life. We were only there for a few hours, just enough time to stroll around the fairytale-pretty streets and enjoy a cup of tea and a scone. (You may have guessed there were lots of cakes and tea involved in my U.K. trip this time around). 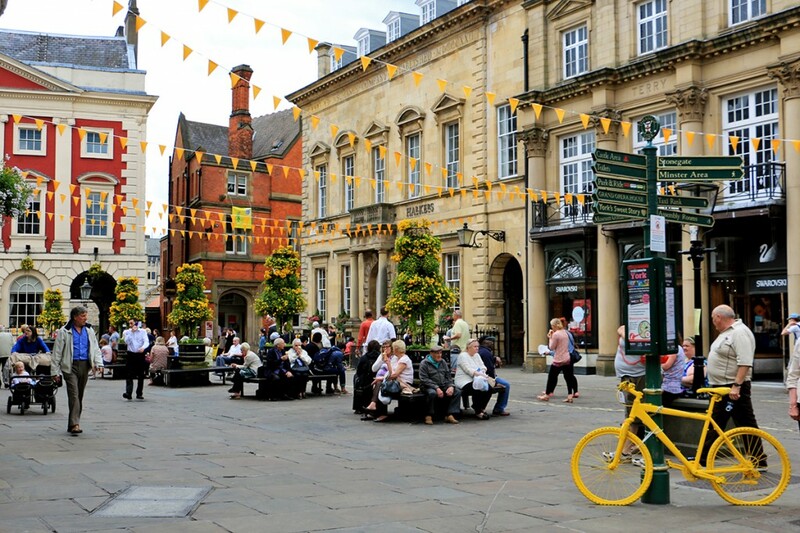 Oh, and of course, as the Tour de France took off from York for one of the stages, the whole city was kitted out in bright yellow bunting. So, even though I find road trips stressful and very physically uncomfortable, seeing all these beautiful sights in just a few days was definitely worth it. While I may not be planning any solo road trips in my near future, getting to discover a little bit of Scotland and northern England proved to be a fantastic trip. What’s the best place you’ve ever seen on a road trip? NextWho Thought Visiting a Hospital Could Be This Fun? I’m so excited that you did this blog post! 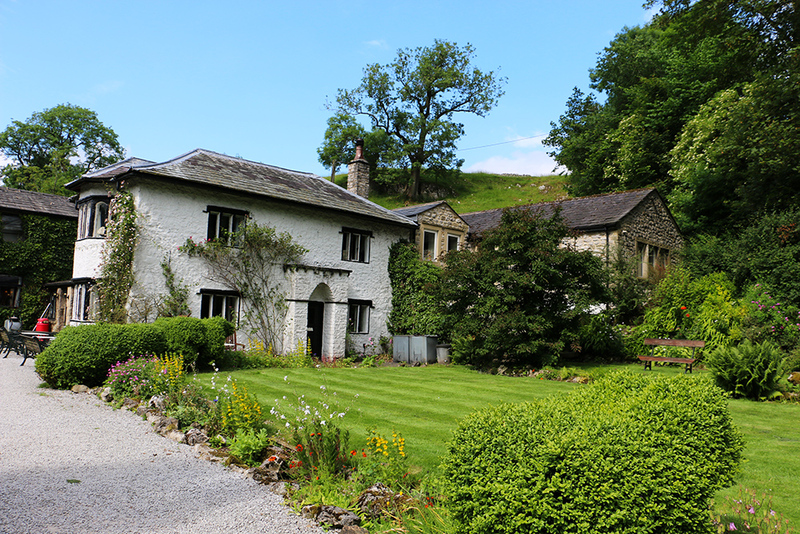 I went to England & Scotland for the first time in 2013 and I’m planning a trip to northern England in November. I’ve been debating whether I should get a car and try to drive to some of the cities up by York, and right now I’m leaning towards doing it! You should definitely go for it! There is so much amazing stuff to see in northern England, and a car gives you easier access to it. Even though I hate being in the car, it’s absolutely worth it there. Thanks so much for sharing. I have not been to UK as yet and hope to get there with the next year or so. You have just enticed me to add a few more places to my every growing list. Thanks for the information and tips, some family is traveling to Edinburg and I’m sure this post help them to find the the best way. To me, Guatemala is the perfect place for a road trip, but for you could be a tough task but or your definitive testing. 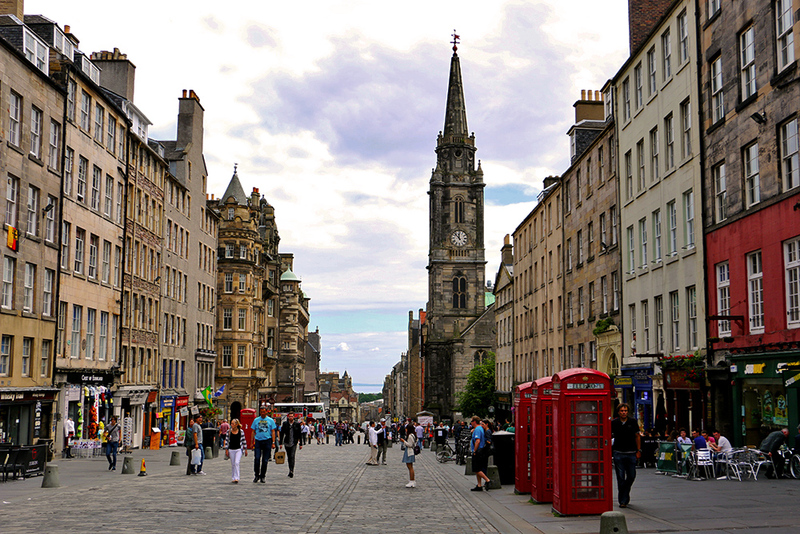 Oh how I love Scotland, and Edinburgh is one of my favorite cities in Europe. I was there this April and I´ve absolutely fell in love with the city even more. We made some bus trips to the north instead of heading south, to Inverness (absolutely beautiful) and the Isle of Skye, and yes the country side is stunning. Ahh I actually get really carsick on the roads, so I feel really bad the whole time I’m in the bar…but it IS lovely to see the sights! I would love to explore more of Scotland, as I’ve mostly been to the cities but everyone says the countryside is even nicer. I’ve been to Edinburgh and it is such a cute little city. You can see most of the sights in a day or two but it’s very charming. My friend studied at St. Andrews about an hour north and while it was pretty chilly when I visited her in April and I didn’t see the sun at all for the four days I was in Scotland, I really enjoyed it. I actually really enjoy road trips. It depends on the scenery and who you are with. Obviously if you’re just taking the highway from point A to point B, then it’s pretty boring. However if you’re doing some kind of national park tour or visiting scenery in an area, it can be a lot of fun. Most areas in the US you cannot visit without a car and some of my best memories traveling comes from road trips: 17 mile drive in Carmel, CA, Death Valley, Bryce Canyon (we couldn’t go hiking there was too much snow so we drove the loop and got out at all the look outs), Utah (in which we discovered Coral Sand Dunes State Park), Normandy countryside, Provence, and the list goes on. I loved Edinburgh too! It’s so much fun. I actually get really carsick on road trips, so even if I have great company and beautiful scenery I always find them quite physically stressful. But sometimes, they let you see all the most beautiful stuff. It sounds like you’ve had some really cool road trips! Ooh car sick! That’s not fun. I actually feel you on that. I do get car sick if I try to read which drives me crazy because I LOVE to read and it’s one of the ways I like to pass the time. I do it anyways and I’m usually okay if we are on a straight highway. However forget the twisty roads… I think it has to do with not looking in the direction the car is going in and looking down and my brain gets disoriented what direction it should be going in and I get all nauseous. Not fun! So I do have a love/hate relationships with road trips that do not allow me to read! Ohhh reading in the car, I am so jealous! I just can’t do that. I agree, the multiple directional inputs your eyes get is what really throws you off. It seems like all of Scotland is somehow linked to Harry Potter. AND I’M NOT COMPLAINING. I went to Edinburgh in the dead of winter and really liked it, so I bet if I went back in summer I’d just have to move there or something. Haha there is a LOT of good Harry Potter-related stuff to see in Scotland for sure! And if you liked Edinburgh in winter, you’d probably love it summer. It is such a fun city! You’re doing a really good job of convincing me I need to make a stop in Galicia ASAP! 🙂 I really have to get over there in the next six months or so. Best place I’ve seen on a road trip is Big Sur in stormy weather with a stop at Hearst castle and at the beach to see Elephant Seals. Ooh I love Hearst Castle! Such a cool building. I’m a little wary when it comes to roadtrips too! I did a big one a couple years ago from Ottawa to Florida and we drove straight back (24 hrs) I literally fell out of the car at the end! A road trip through the UK sounds a little more exciting though- I LOVE Edinburgh ( also a big Harry Potter Fan) I’ve only been to London in England but Durham and York look gorgeous. Uggh 24 hours in the car sounds NOT fun! Still, sometimes you do get to see some amazing stuff. Both Durham and York are so lovely, they were definitely worth the trip! beautiful photos! looks like a great trip! What a great road trip. Love the architecture and the sheep! That plate of food looks interesting – what is it? It was fish, mashed potatoes with leek, more leeks, and some kind of creamy sauce. It was delicious! …. I need to go here. Now. Old map shops and Harry Potter film sets?? Say no more!! Not to mention the photos are lovely and quaint and just beautiful. Thanks, Alli! 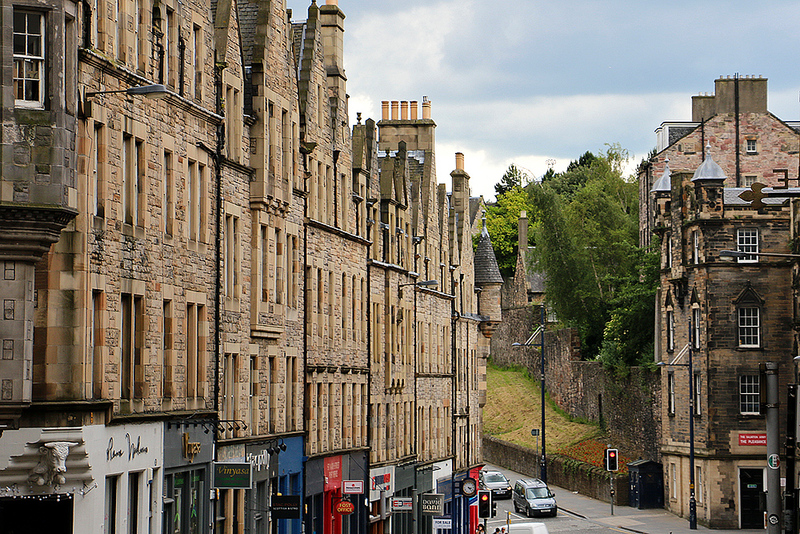 If you’re a Harry Potter fan, you would love Edinburgh! My friend took me round to lots of little places that have something to do with the books or movies there. Yay! I’m glad I’m not the only one. 🙂 We went to so many cool Harry Potter places, and it wasn’t even on purpose. I love both York and Edinburgh but never really think of doing a UK road trip – most of mine have been in the US or Australia where the distances are so much bigger. May have to give it a try closer to home though (especially as like you I’m not the biggest fan of spending too much time in a car anyway!). I quite like UK road trips. You could stop every hour and see something pretty, as opposed to giant stretches of US freeway. The smaller windy roads aren’t so nice though! There’s no better place to take up a road trip than Scotland. Great pictures! Yeah, there are some great little stops in the UK! We could have easily stopped at three times as many places just on that bit from Edinburgh down to the Midlands. I’m usually not a big fan of road trips either, but something like this would be fun. I think the key is to have lots of place to see and stop along the way. Otherwise, just driving for hours is incredibly tedious. Glad you had a good time! Yeah, you definitely have to stop by lots of little places to make it worth it. Luckily, there are lots of great stops in the UK! You certainly picked an amazing route to try and help you change your mind! I used to live very close to Rosslyn Chapel, and have been to all these places plenty of times (I’m from Liverpool so they are relatively close for me!) and I highly, highly recommend the North of England and Scotland to any visitor! Far too many people just stick to London! I agree, London is great but the U.K. is full of fantastic spots! I love the north of England. Great post! I love it when people explore England/Scotland and do something different than go to London! Yorkshire is indeed a beautiful place, the scenery is just stunning. I love your rebellious attitude towards taking photographs – It irritates me when establishments don’t allow them, I really don’t see the point, that’s why when I visited St Paul’s in London (Hypocrite I know) I went mental and took loads too! Brilliant photos and insight into your road trip! I have lived in England for over 8 years, and I love it. Scotland is even prettier, if possible! You captured great images of it and made me truly miss it! Thanks, Claudia! I love traveling around the U.K., there is so much great stuff to visit. Isn’t the UK gorgeous! I ended up living there for 7 years and did a lot of trips around the country. There is still so much I want to see though! Yes, there is just SO much stuff you can go see! Lots of my friends have been to the big cities, but there are so many places to visit. I’m the total opposite and love road trips. I’ve done the journey between Edinburgh and York on the train and it was pretty impressive, but in the car looks even better. My favourite road trip so far was in NZ around the very northern part of the north island along the coast. The scenery is just so stunning over there. I’m embarking on anoter NZ road trip in a few weeks around the south island and expect that to be even better. I’d love to do a trip like your New Zealand one! Have fun on your next one! Hey! Great photos!!! The ruined abbeys look like my kind of place… and I do love road trips, I believe my longer and coolest one was from Toronto to NYC some years ago. I love road trips! If I’m not driving I like to contribute with some entertainment (usually singing badly!). Route and pics are great! Haha singing badly is always a necessary component of any road trip! 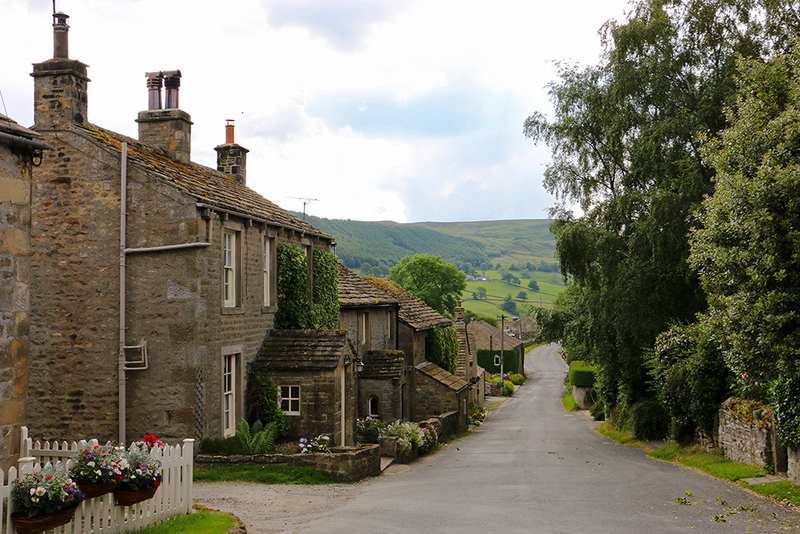 Yorkshire looks so pretty – I can understand why LP was impressed. Of these places, I’d most like to spend time in Edinburgh…but a road trip might just be in order, provided everything is in bloom. Edinburgh is a wonderful city to spend time in! I could have spent months on end there. We’ve been contemplating a weekend getaway to Edinburgh and now I can’t wait to go! The best road trip I ever took was in Portugal. My mom and I rented a car and drove around for two weeks. We got to see so much more of the country than we would have just relying on public transportation. My husband and I also just did a month-long road trip around the U.S. and I have to say that I enjoyed it much more than I thought I would. Beautiful spots you stopped at. I was in Edinburgh 2 weekends ago. Cant wait to share pictures with you. 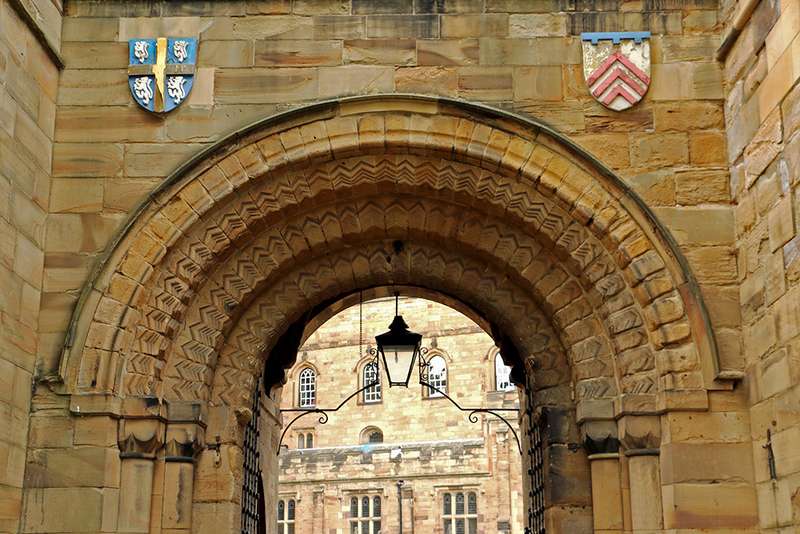 Lovely picture of Durham., which is on my list too. Exactly! A little walk and some fresh air are a great remedy to carsickness. We are currently on a Scotland Road trip Adventure and are loving every minute! We started in Edinburgh and went all the way north before heading down the west coast. We still have a week before heading down to London. Great pictures! Oh that sounds fantastic! Hope you’re having a lovely time! Lovely photos, specially the one of the sheep! Edinburgh looks absolutely gorgeous. I have not seen Europe yet, but I’d love to go to Scotland whenever I make it. Oh and those students are incredibly lucky to get to live in a castle! My favourite place for a road trip was New Zealand, specially the South Island. With its mountains, grasslands, farms with sheep, lakes and glacial valleys, the landscape was unbelievably beautiful. Thanks, Natasha! New Zealand sounds incredible, I would love to go there someday (soon!). ”One of the definite advantages of taking a road trip over a flight is that you can say “Oooh, what is that? Let’s stop and get out and have a look!”” Without a doubt! glad this trip twisted your view on road trips! Perhaps we are blessed with an entire coastline and sunshine in West Australia, but the a road trip up to Coral Bay up the entire west coast is second to none, waking up to the sound of the ocean and breaking waves every morning is hard to beat. Yeah, there’s not much that’s nicer than waking up to an oceanfront view! I don’t mind road trips as long as I personally don’t have to drive (I really hate it. It stresses me out!). Last year, my mom and sister took a long but fun road trip from Ohio to Louisiana. We got to see some pretty cool things along like way like Elivis’ Graceland! I hate driving too haha. I hear Graceland is totally trippy and really fun to go see. Sounds like a great little road trip 🙂 Crazy that you went to my hometown York! I’m normally reading blogs like this and ending up envious of all the cool places people go, but this time I was surprised to see a photo of the street I walk down everyday on my way to work! Glad you enjoyed your time here, always makes me realise how lucky I am to call this place home! I’m very intrigued about ‘Britain’s Most Boring City’ though. I’m trying to think of somewhere a little further south but can’t think of anywhere I’d write off as boring. Which city is it? York is so lovely! It’s a bit like British Disneyland but very charming; I love it. I’ve actually been a handful of times, as my mum’s family is all from Yorkshire. Wow these photos are amazing! So vivid, and the scenery ain’t bad either 😉 I’ve never been drawn to the UK so much, but these images really capture something alluring, especially Dryburgh Abbey?! How cool is that moss growing over the stones..so green, everything! Still haven’t been to Edinburgh but I have heard so many good things about it! especially in August! Oh it’s lovely! It’s definitely one of my favorite cities, it’s got so many nice things to see. What a great trip – and some great pics to go with it. Thanks for sticking it to the man and taking some illegal snaps. I hate it when they won’t let you take pictures – with flash i understand – but regular pics without flash? common people! I think this looks like a great road trip but certainly one to do in the summer months, I don’t think it’d be so much fun this time of year…. I hate it too! I guess Rosslyn Chapel got into a sticky legal situation when somebody injured themselves taking a photo there (they tripped on the uneven floor, I think). But still! It might be a very cold road trip right now, but the Yorkshire Dales are so beautiful when they’re covered in snow! Edinburgh is beautiful! I would like to do roadtrip through Scotland 🙂 As I matter of fact I never did any roadtrip, I have to change that soon! Great post! I have been to all these places and I have to second the fact that they are beautiful and amazing! Loving the photos, Jessica!